Start living the portable lifestyle you deserve! You’re already one step closer just by owning the GCE Zen-O portable oxygen concentrator. But you will simply be unable to enjoy your newfound portable freedom without at least one GCE Zen-O battery. Even if you currently have a Zen-O battery, why not extend the time you are away from home with the addition of a second battery?! Options are fantastic, especially when you can customize the weight and battery life of your GCE Zen-O portable oxygen concentrator to best meet your needs. 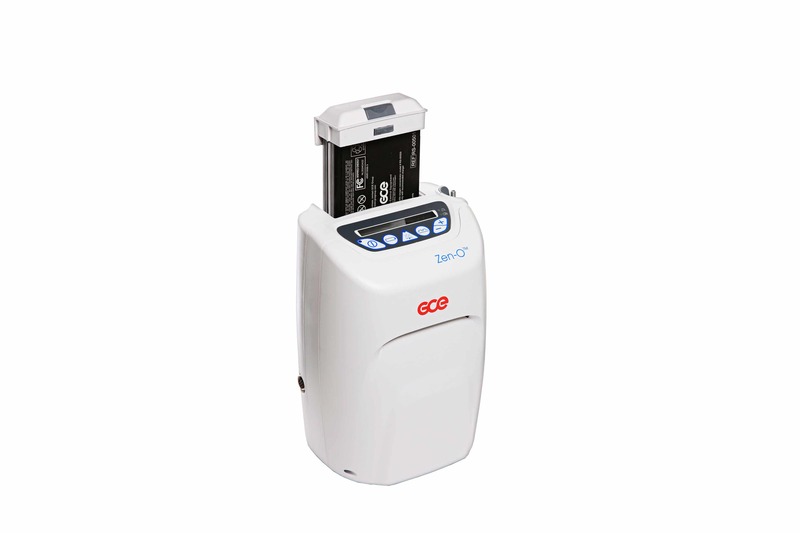 Specifically, the GCE Zen-O oxygen concentrator allows you to run either one or two batteries simultaneously with the removable battery tray. By doing so you can effectively choose between a lighter overall package (10 LBS) with reduced battery life, or you can opt for a heavier weight (11.45 LBS) in exchange for longer portable operation. Choosing to use one battery will deliver up to 4 hours of operation on a pulse setting of 2. Are you a continuous flow user? On a continuous setting of 2, the Zen-O battery will offer up to 45 minutes of oxygen therapy per charge. On the contrary, opting to use a dual battery setup will deliver up to 8 hours on a pulse setting of 2. While delivering up to one and a half hours of battery life on a continuous setting of 2. You can see the full battery specs for one or two batteries below. When the time comes to recharge your GCE Zen-O battery(s), you have two options to choose from depending on where you are. The most common method of charging is with the AC power supply. Which can be used anytime you are near a standard wall outlet, such as at home while watching T.V., at work, or while in the hotel during travels. All pulse and continuous flow settings can be used while charging your Zen-O batteries with the AC power supply. Whenever you are enjoying your newly restored independence and you Zen-O batteries are running low, there is no need to freak out. Because you can charge and power your Zen-O in your car, truck, SUV, or R.V., through the cigarette lighter with the DC power supply. You can receive oxygen therapy and charge the unit simultaneously on all pulse and continuous flow settings with the DC power supply. Meaning you can conserve your battery life by plugging the Zen-O into the DC power supply in your car, and then use your battery life while on the go. However, it’s important to realize that if you are using your GCE Zen-O while charging your batteries with the AC or DC power supply, the duration of the charging cycle will increase. Don’t worry about keeping track of the time since you last charged your Zen-O batteries. Instead, the GCE Zen-O portable oxygen concentrator’s LCD screen features an on-board battery gauge. By doing so, you will effectively have an accurate measurement of your remaining battery life with a quick glance at the screen.